Let’s take a look at each of these concepts and explore how you can make a few changes right now, that will help you get and stay on track to permanent weight management. Attention all you perfectionists out there in diet and exercise land. Although you might think perfectionism is a desirable trait, that it keeps you on the straight and narrow, and helps you achieve, achieve, achieve, our experience suggests that perfectionism isn’t all it’s cracked up to be. Firstly, being a perfectionist means having very high standards. What’s wrong with that, you ask? Perfectionists tend to put unreasonable pressure on themselves to meet those high standards. And if that bar is too high, if your expectations are too lofty, you’re likely to feel like a failure if you don’t succeed. And if you do succeed, the cost of that success is likely to be enormous. Perfectionism is a problem when you’re dieting and exercising, because your expectations may be unreasonable. For example, you may decide you’re going to exercise for an hour every day, seven days a week, because that will help you reach your goal faster. But what about life (which has a nasty habit of intervening)? What happens when you get a cold and either stop your program because you’re too sick, or keep exercising and make yourself sicker? Perfectionists are likely to fall prey to the all-or-nothing syndrome: they’re either exercising for an hour every day and dieting conscientiously, or they’ve stopped exercising all together and are back to old eating habits. If you’re a perfectionist, try to set that bar a little lower. Don’t be so tough on yourself – aim for flexibility and consistency without rigid perfectionism. Procrastination feels like a curse that inflicts most people from time to time. And when it comes to starting a new eating and exercise plan, most of us are masters at prodding the inner procrastinator into play. Procrastination makes even the toughest of us feel stressed and guilty. Research suggests we procrastinate because we’re fearful of failure, starting a new task feels too stressful, or it’s a kind of rebellion. I’ll start my diet on Monday, is a common form of procrastination, as is I’ll exercise tomorrow instead of today. What can you do about procrastination? 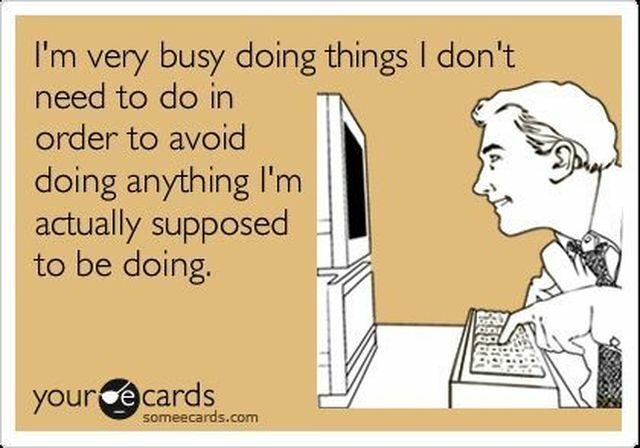 Recognise that you’re procrastinating (as opposed to coming up with good reasons why you can’t do something). Then work out why you procrastinate. Keep a list of all the things you procrastinate about, and see if there’s a common denominator that will explain why you do it. If you’re having trouble seeing a pattern, ask someone you trust to help you. Then focus on one thing at a time, limit distractions, break down overwhelming tasks into small steps, and get help with getting organized. Putting yourself and your needs first seems to be a foreign concept to many people who struggle with their weight. We’re used to turning ourselves inside out to look after everyone else, and placing our needs at the bottom of the list. And not surprisingly, exercise quickly falls to the bottom of the list. But put your hand up if your health is important to you. Without your health and fitness, what does life hold for you? If you don’t pay attention to your health needs, are you going to be able to run around doing everything you want to do till you’re old and grey? You only get one life, it’s not a dress rehearsal where you get to practice until it’s perfect and then do it all again. You have one body, and you owe it to yourself to treat it with the respect it deserves. That means taking it out for exercise, watering it, and filling it with high quality fuel. If you’re struggling with your weight, chances are you’re not prioritizing yourself and your needs. Delivering health & wellness to Melbourne since 2002. Want to stay up to date with the latest health & wellness info? Join our newsletter list and we'll keep you in the loop. © Copyright My Trainer Corporation 2019. All Rights Reserved.